Why wait for March Madness - Find 3 Madness Promotions Now! Ring Lugs and Wire Ferrules? 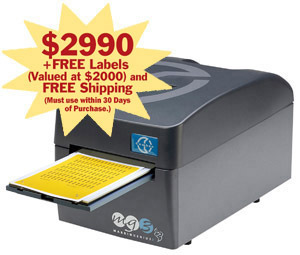 Do you need to Print Terminal Block Markers? Wire Markers? Panel Legends? Switch Labels? If you answered YESto any of the above questions you need to check out the "Tooling Madness Promotions" from ASI. Print Every kind of Label, Legend and Marker with the EZ to set-up and use Universal Industrial Thermoprint System, MarkinGenius® MG3. You will not find an Easier to use more Versatile Industrial Printer on the market and now with this promotion it is Affordable for any size project. Our "Tooling Madness Promotion"includes a Special Price of $2,990, a Savings of $299 over the normal Price of $3,289. To make the offer Really Mad we are giving you $2,000 in FREE Labels, Legend Plates, Markers and other Print Material with every Purchase of an MG3 during this promotion. That means you are getting the Best Printer System on the Market for Less Than $1,000. If you need a printer Hurry, this Printer Madness Promotion is for a Limited Time. Do you Crimp Insulated Wire Terminals, Cable Lugs or End Sleeves from 1/0 to 300 MCM?Would you like to Make the job EZ for your technicians and assemblers? 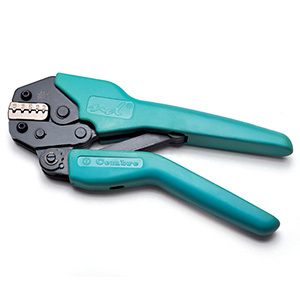 The Battery Operated B35-50MA is the Perfect Crimp Tool for these Large Conductor Jobs. 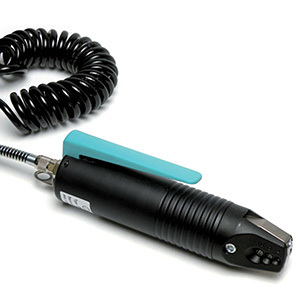 Using the Latest Technology, an 18.0V 2.0 Ah, Li-Ion Battery, this Robust Tool has a Crimping Force of 4 tons and Easily Crimps up to a 300MCM cable. The B35-50MA is balanced for One Hand Operation, has a 180° Rotating Head, and accepts a Range of Crimping Dies for many applications. It is supplied with 2 Batteries, a Battery Charger, a Sturdy Storage Case and you can own it now for a Special Price of $2345, a Savings of $1,166 over the original Price of $3,511. 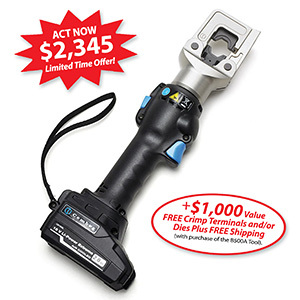 To make the promotion a "Mad Deal"we are also Offering $1,000in FREE Crimp Terminals for each Tool Purchased during this Promotion. Promotion and the Tool features. Really BIG Cables and Terminals and really CRITICAL CrimpsCall for a really Versatile and Reliable Tool. The NEW B500A is one of the Most Advanced Heavy Duty Battery Operated Crimp Toolson the Market for very Large Cables ranging from 3 AWG up to 500 MCM.The Advanced technology 18.0V, 4.0Ah, Li-Ion Battery ensures up to 600 Crimps Per Charge depending on wire size. The on board Microprocessor records Crimp Data up to 200,000 events which can be displayed on the tool or Downloaded to your PC for evaluation and record keeping. 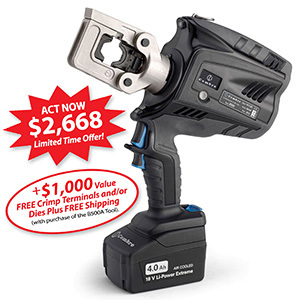 NOW Offered at a Special Price of $2668 during our Promotion, a Savings of $1358 over the normal Price of $4026.To make the Promo a MADEvent, we are Offering $1000 in FREE Crimp Terminals and Supplies with the Purchase of each tool. Enjoy these Pre-March Madness Deals Now. You can Count on ASI for All of your Production Tools, Terminals and Identification Products. The ASI ASI305001 DIN Rail Cutter is an Industrial Bench Top designed DIN Rail Cutter that Easily cuts the 4 main Sizes and Styles of Industry standard DIN Rail with a minimum of pressure and without leaving any burrs on the end of the DIN Rail. ASI2591260 PNB-6KEPneumatic Wire Ferrule Crimper for crimping 24 to 14 AWG ferrules. This hand held crimper rapidly crimps insulated and non-insulated ferrules. It is lightweight and easy to use. 2590080is a Ferrule Crimper with Five Positions for crimping both insulated and uninsulated wire ferrules with a wire gauge from 22 to 16 AWG. 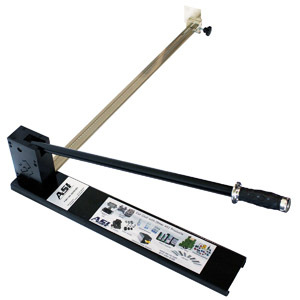 This small and compact manual crimper is ergonomically designed which reduces operator fatigue. 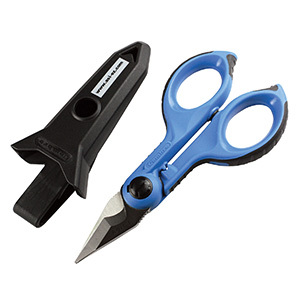 2591267 is a professional wire cutter and crimper. This wire cutter cuts up to 1/0 AWG cable.